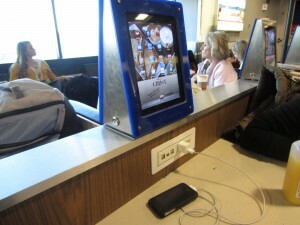 What do grade school cafeterias, Times Square and airports have in common? You’re guaranteed to have a frozen, never fresh, meal probably made from a dry mix of cardboard & sand, topped with a sauce that might be Catchup or quite possibly glue. It’s the kind of food that erases taste buds and binds stomachs, leaving with you with nothing but regret and sadness. It’s the antithesis of good food, the opposite of tasty treats, the antipodal of awesome food. Whats worse, in Times Square & airports, you’ll pay NYC Steak House prices for the same cold, dry and flavorless sandwich that only cost $1 back in your grade school cafeteria!! Alas!! Sound for the troops fellow Food Fanatics!! THE REVOLUTION HAS BEGUN!! 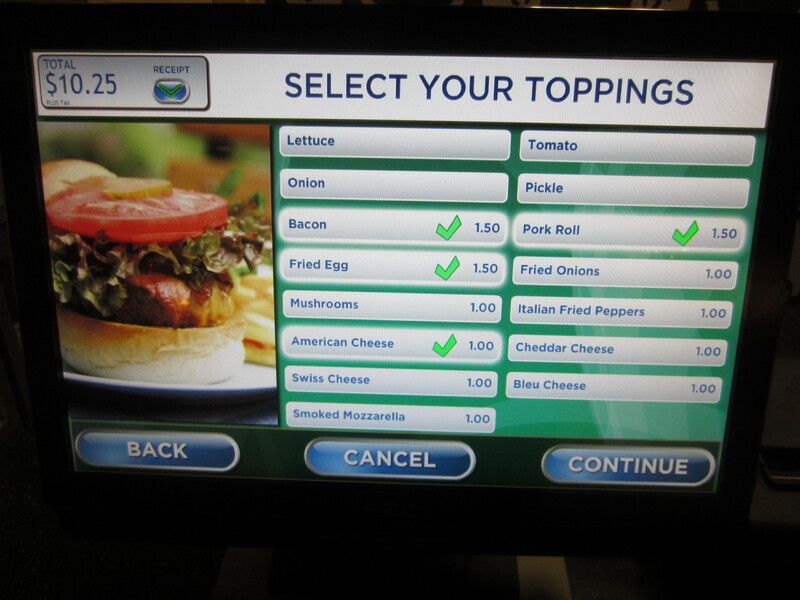 After years and years of suffering through the most generic, bland, reheated, garbage food we could possibly stand at America’s airports, the change has begun. Thanks to OTG Management, the Delta Terminal at New York City’s Laguardia airport has yanked the pin on the good food grenade. 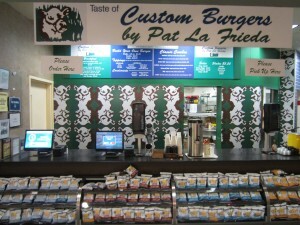 Welcome Custom Burgers By Pat LaFrieda! While the restaurant is not owned or operated by Pat LaFrieda, New York’s King of quality Meat purveying, they do offer a specialized blend of ground Beef that’s been hand selected to be served only at this airport counter restaurant. The menu is rather simple, offering a variety of Burgers, Sides, Shakes & Egg Sando’s for Breakfast. 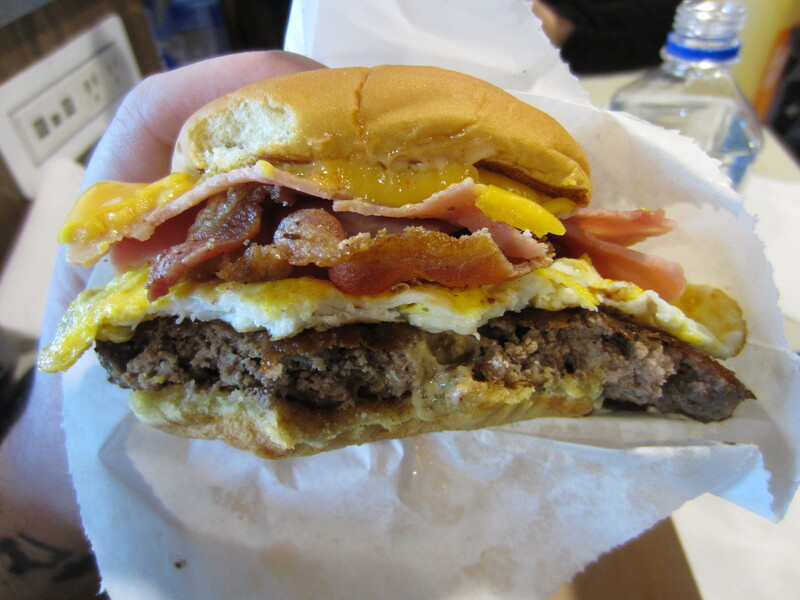 For those not afraid to get on the AM Burger Train, fear not, they are available during Breakfast hours. 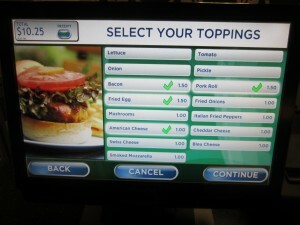 It’s all done made to order by selecting your order via a touch screen, or as some like to call it, Wawa style. A few minutes later, your Burger comes Shake Shack style, in a brown cardboard box with a sandwich wrapped in plastic paper. Early AM flights unfortunately are a part of my reality, especially when I want to get where I am going right away. As a result, there’s been a lot of heat lamp Sandwiches, stale Muffins and bland Granola Bars in my past. This little discovery, on my way home to spend the holidays with my family and friends in Michigan was a bright and wonderful way to start off a nice little trip with Mrs. Rev. I don’t EFF around nor do I mess around, especially when it comes to Burgers. It can be the middle of the night, the afternoon or the morning and I will eat a Burger. Slap on some Eggs and you got yourself a great Wake Up Morning Burger. My order today; Hamburger with Pork Roll, Fried Egg, American Cheese, Bacon and Spicy Garlic Aioli. The Burger is griddle cooked and served on a soft and tasty Potato Roll. Let’s start with the negative; the Beef-t0-Bun ratio was a little off with a good 2-3 bites hanging out one side of the Sandwich. Not the biggest deal but worth mentioning. The patty, while made of great, fresh, quality Pat LaFrieda Beef was over cooked to a well done state, which I can understand being difficult to do less at A. an airport, B. a smaller sized Patty. My last complaint coming from what one might consider false advertising. Pork Roll, or as it is also commonly known, Taylor Ham is a product most prevalently found in parts of New Jersey and Pennsylvania. It’s a salty, smoky piece of processed Pork in a lunch meat like form. It’s absolutely fantastic on a hearty Breakfast Sandwich and a coveted local specialty. Cross the border into NYC and it’s as though the Meat is that of lore and can not be found. Seeing it on a specialty Burger menu at an airport in Queens, well that brings about a bit of excitement. Sadly I must report that the “Taylor Ham” at Custom Burgers is no more than steamed slices of Ham. 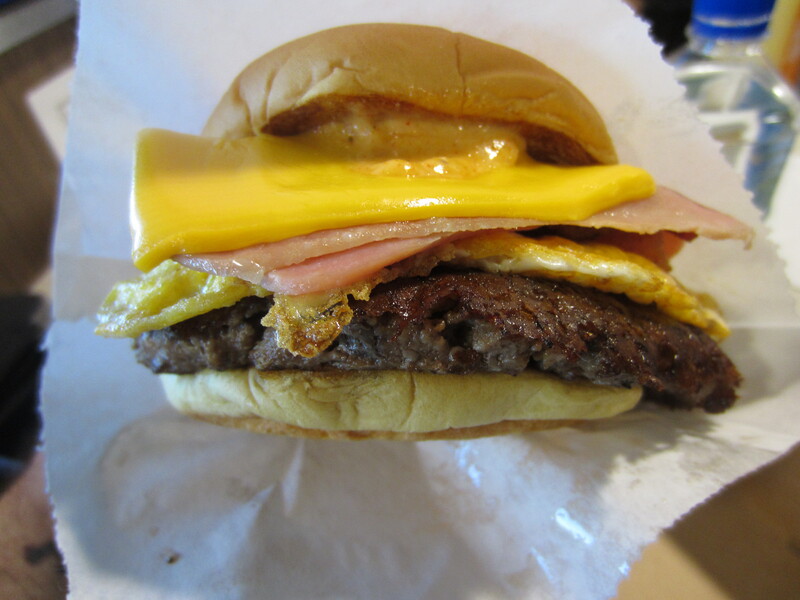 I watched them prepare it and all excitement I had for a Pork Roll topped Burger was wiped out. That aside, the Burger was pretty damn good, especially for airport Food! The Bacon was not like the skimpy, sad looking Bacon found on most fast Food Burgers but was hearty, think and smoky. The Fried Egg was actually cracked from a shell and cooked before placing a top the Beef, as opposed to a pile of preformed Egg cake, steamed or microwaved to room temperature. 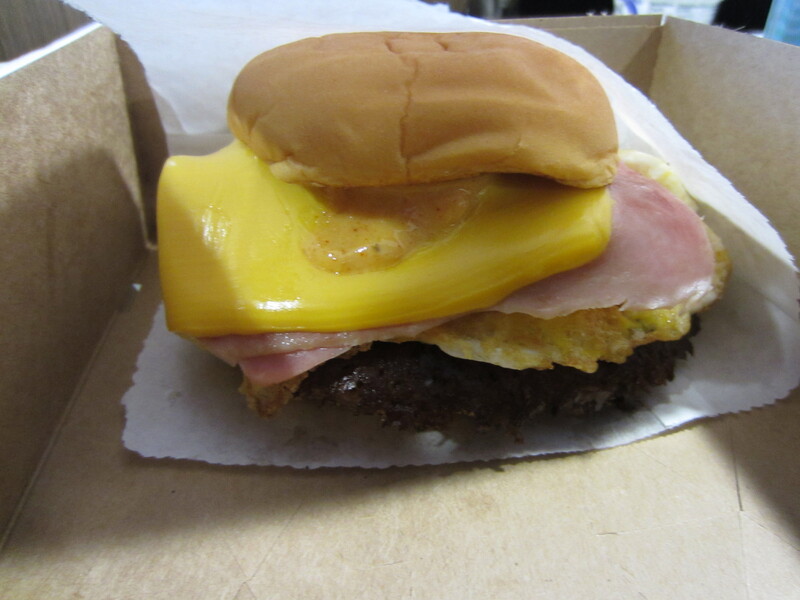 A nice slice of good old American Cheese was placed on top only to be followed by the tangy Aioli sauce, which replaced the need for the mix of Ketchup and Hot Sauce I would normally place atop a Egg Sandwich. Overall, the freshly made, quality Hamburger at Custom Burgers by Pat LaFrieda will make the LGA your new favorite airport and Delta your new favorite airline. Custom Burgers By Pat LaFrieda scores a 2 on The Rev Meter. 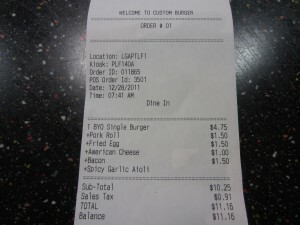 This entry was posted in Burgers, Gourmet Burgers, Hamburgers, New York and tagged airport, burger, cheese, ciancio, conquest, custom burgers, custom burgers by pat lafrieda, delta, french, fries, great, hamburger, laguardia, lga, new york, ny, nyc, otg management, rev, review, terminal, the, the rev meter for social community. Bookmark the permalink. This isn’t in the Delta shuttle terminal is it? Their veggie burger is great. My husband and I stumbled upon this place before a flight and we still talk about it!! Topped with those fried jalapenos…perfection. 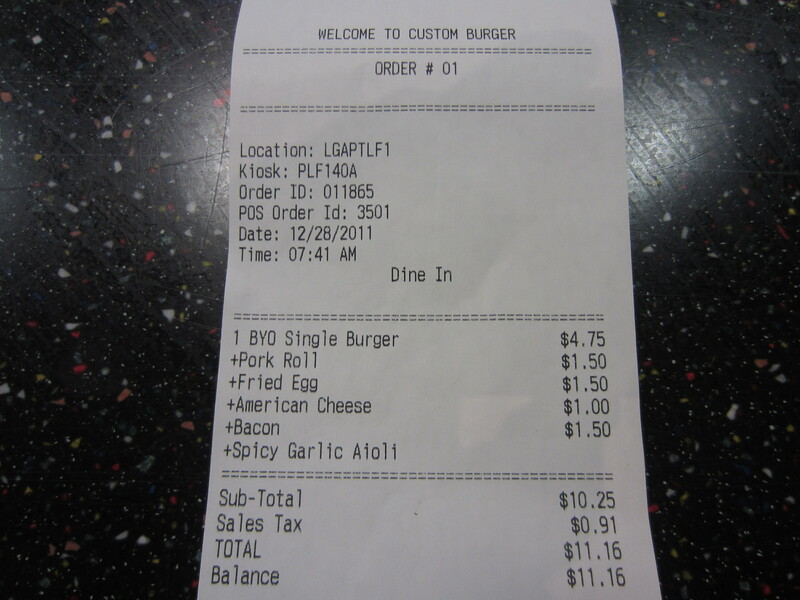 The only thing is that it was soggy since we didn’t realize you had to pay at the cashier first before they’ll release the burger. We’ve said that as soon as we are rich, we’ll fly to NY just to eat there again.